This website is being developed and revised over 2014-2018. It includes resources to support the successful integration of the 8 science practices in NGSS into k-8 classrooms. This website includes resources, including a library of videos, to support teachers in integrating argumentation into their classroom instruction. The resources are structured around four elements that students need support with: 1. Using high quality evidence, 2. Providing strong reasoning, 3. Considering multiple competing claims, and 4. Building off and critiquing each other's ideas. This webpage includes assessments and rubrics for assessing students' abilities for argumentation across writing, reading and talking. This website includes sample lesson plans using the claim, evidence and reasoning (CER) framework developed by teachers in the Boston Public Schools for elementary, middle and high school students. This webpage includes resources related to science and literacy. If you scroll down the page, you will come to a heading - Practicing Argumentation through the Common Writing Assignment. 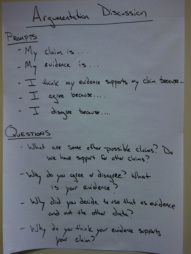 i worked with the BPS science department and science teachers to develop claim, evidence and reasoning (CER) writing prompts for 4th - 8th grade. In this podcast, Dr. Kate McNeill and Dr. Joe Krajcik introduce the claim, evidence and reasoning (CER) framework and discuss it as a teaching tool in relation to the science practices in the Next Generation Science Standards (NGSS). These two books and the associated facilitator guide's were written to be used with pre-service and in-service teachers to support them in integrating the CER framework into their instruction. They each include a DVD with videos of k-8 instruction. McNeill, K. L. & Krajcik, J. (2012). Supporting grade 5-8 students in constructing explanations in science: The claim, evidence and reasoning framework for talk and writing. New York, NY: Pearson Allyn & Bacon. McNeill, K. L. & Krajcik, J. (2012). Book study facilitator's guide: Supporting grade 5-8 students in constructing explanations in science: The claim, evidence and reasoning framework for talk and writing. New York, NY: Pearson Allyn & Bacon. Zembal-Saul, C., McNeill, K. L., & Hershberger, K. (2013). What's your evidence? Engaging k-5 students in constructing explanations in science. New York, NY: Pearson Allyn & Bacon. Zembal-Saul, C., McNeill, K. L., & Hershberger, K. (2013). Book study facilitator's guide: What's your evidence? Engaging k-5 students in constructing explanations in science. New York, NY: Pearson Allyn & Bacon.